My cousin Mike once told me, "Every time I see you outside of a family gathering, you're surrounded by potato skins." He's not wrong. I *love* potatoes and cheese. To me, there is no better duo - forget Simon & Garfunkel, Cory & Shawn, and Taylor Swift's cats, Meredith Grey & Olivia Benson. My list of potato and cheese combinations starts at potato skins, but it doesn't stop there: potatoes au gratin, cheese fries, cheesy potato soup, cheddar and sour cream potato chips. I can't get enough. I thought, at age 30, I'd experienced everything the potato and cheese world had to offer me. But imagine my delight when I found out that two of Switzerland's national dishes are rösti and raclette. Okay, well I had no idea what those were by the names, but get this: rösti is a dish of grated potatoes, formed into a patty and fried (think about the hash browns you get at a good NJ diner) - and raclette is cheese on a wheel that is heated up and then scraped off of the wheel right on top of dishes such as rösti. I was going to do just fine in Switzerland. Kater and I had two experiences with rösti and raclette. Our first was in Interlaken on top of the Metropole Hotel. Although an unfortunate eyesore on an otherwise adorably traditional mountain town, it boasts an amazing rooftop view and restaurant. I've been to many rooftops in New York, but nowhere here compares to the view we took in at Top O' Met. There are pairs of binoculars at each table so you can zero in on Jungfrau, one of the highest points in the Swiss Alps, covered in snow in May. We ordered Swiss beer (every one of which I loved) and enjoyed watching the hang-gliders land in a field below us after jumping from somewhere, though we struggled to figure out from where. It didn't matter, we were not up for that terrifying adventure that day. Instead, we were up for figuring out what rösti and raclette tasted like. We shared a small portion of their rösti with raclette and tomatoes and found out they taste exactly like happiness. I knew that half of a small portion would not have been enough to sustain me until my next trip to Switzerland and that I'd be eating rösti and raclette again. I didn't know it would be that same day. 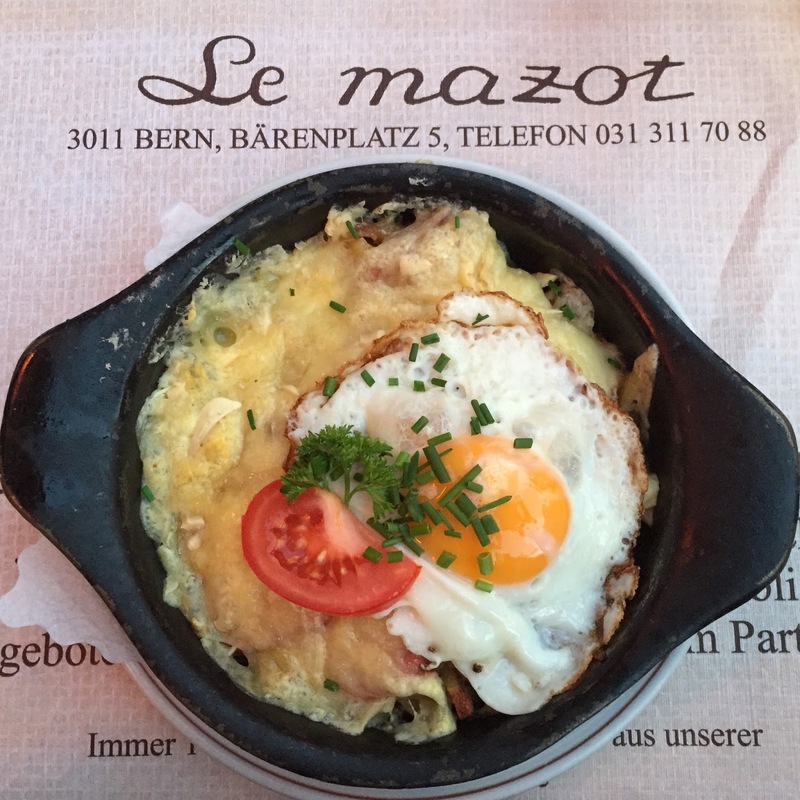 We'd moved on to Bern for the evening and were looking for places to eat dinner when we came across reviews for Restaurant Le Mazot, including some raving about the rösti. Le Mazot not only had rösti, they had an entire rösti menu. Hi, hello, one of each, please, thank you. Kater ordered a Rösti Dauphinois - rösti, garlic, butter, cream & cheese - while I went with the waiter's favorite, Rösti Oberlandais - rösti, ham, cheese, & fried egg. These röstis came out in cast-iron skillets and were absolutely incredible - not to mention adorable. Each time we thought we were filled to the brim, we went in for more, especially for the parts that had burned onto the skillets by the end of the meal. Meals where I have many "last bites" are the meals I'll remember forever. The next time Kater and I get together has to be in the East Village, here in New York City. I've been told of Raclette, a relatively new restaurant specializing in French Swiss cuisine. It sounds promising, being named after the Swiss cheese, but I am unsure at this time if there is rösti on the menu. If they don't have it, that would be a straight-up Swiss Miss.